Enter the lairs of the Damned. Uncover chambers that have been hidden from mortal view for centuries. Delve into the most foreboding corners of your imagination. Discover tomes, artifacts, and remarkable havens. Or avoid the skulking and immerse yourself in the lights and sounds of your very own nightclub. You can go to all these places and more, without ever leaving your home. The Book of Props will take you there. 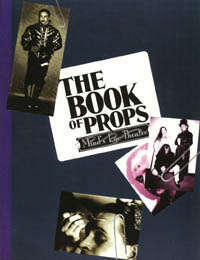 The Book of Props is a comprehensive how-to for designing everything from sets to costumes to believable characters. This book combines the best of Live-Action and stage theatre, enabling you to bring the World of Darkness alive as it's never been betore. Techniques and tips actors use to get into and maintain a persona. This title was added to our catalog on October 23, 2004.